What is the AM466 Plug In Appliance Module? The AM466 is our main 3 Pin Plug In Module. If you need a 2 Pin Module, checkout the AM486 2 Pin version. Simply plug the AM466 into an outlet then plug the unit you wish to control into the receptacle on the bottom side of the AM466. Set the code to match your remote and you are UP and RUNNING! This plug in module is rated at 15amps, 1/3hp, 500 Watts. 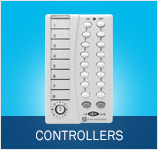 It can be used to control things like Fluorescent lighting, Air Conditioners, Hot Tubs, Computers, Radios, Fountains, small pumps and motors, etc. Automate these devices within minutes with the AM466 3-Prong Plug In Module. What are the advantages of using the AM466 Plug In Appliance Module? Easy Programming, anyone can do it! What other products work with the AM466 Plug In Appliance Module? The AM466 is a X10 Receiver and will receive commands from any X10 Controller (transmitter).